1. Room on the Broom (Julia Donaldson)- Iggity! Ziggity! Zaggity! Zoom! I kid you not, M has this entire book memorized, and can recite it to you on command. She knows when to turn the pages when you read it to her. I think my husband has read this to her over 100 times and we have only had it for about 6 months. I thank Grandma for bringing this delightful book into our lives. 2. Pout-Pout Fish in the Big-Big Dark (Deborah Diesen) - We wore out the original Pout-Pout Fish book, so I was ecstatic when we discovered the second book about the "glum gloomy swimmer" and his journey to find Ms. Clam's pearl in the deep dark ocean. M goes around the house saying "I am smarter than a dolphin, I am stronger than a shark, I am faster than a sailfish...but I'm scared of the dark, Mom!!" 3. The Napping House (Audrey Wood) - This is another one we have Grandma to thank for. It is a simple tale of a bunch of characters sleeping on top of each other, and then waking each other up, but M loves it. She thinks it is high comedy. 4. 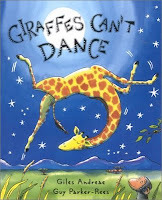 Giraffe's Can't Dance (Giles Andreae) - Oh how I love this rhyming tale about a Giraffe who finally finds is groove. This is such an adorable book, and one that I love reading to her every chance I get. 5. Pete the Cat series (Eric Litwin and James Dean) - We have a couple books from the Pete the cat series and really love them all. They are silly stories about a cat, Pete, who wears sneakers and sings groovy songs about them. The only thing about these books that irks me is that he talks about wearing his 4 shoes on his feet, and then in the next drawing he has two shoes on, and is playing the guitar with is other paws, or doing something else. Hell, when you have read it 50 times you tend to get a little nitpicky. 6. Sophia the First (Cathy Hapka) - Something happened in one of the tv episodes of Sophia the First that scared M at some point, so she now refuses to watch them. The book however is her absolute favorite book to read at bed time. She is a sucker for anything princess, but truly loves hearing about Sophia's journey from small time girl to palace dweller. The illustrations in this book are truly fantastic - much better than the choppy animation of the television show. 7. 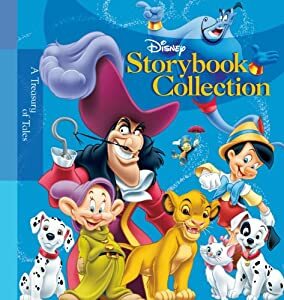 The Disney Storybook Collection (and other Disney Collections) - These are always popping up at Costco, so we have a large collection of these classic collections of Disney tales ranging from Pixar themed to Winnie the Pooh, and of course the Princess Collection. A story from one of these books is always requested at night. Keep an eye out at your local Costco for these!